"The crew showed up on time and moved my grand piano very carefully. They had special equipment and were very professional in all they did. This included going up a flight of steps with my piano and they did so without any harm to the piano, walls, or steps." "The guys were very punctual, super nice, careful and quick. After calling many places and finding Jones Piano Services had the best price, I am now even more glad that I chose them to move my piano home from Nicholasville back home to Lexington, I would Highly recommend their services!!! - Stacey E."
"Great company to do business with. You were affordable and delivered as promised. We couldn't have asked for better service. We never heard your men complain about the hard work! I had to give them a monetary tip!" The Jones Team has a combined 45+ years of experience in the piano moving profession. The owner, Virginia Jones, has been coordinating piano moves for 25 years - the crew leader, Danny Jump has been moving pianos for 19 years. 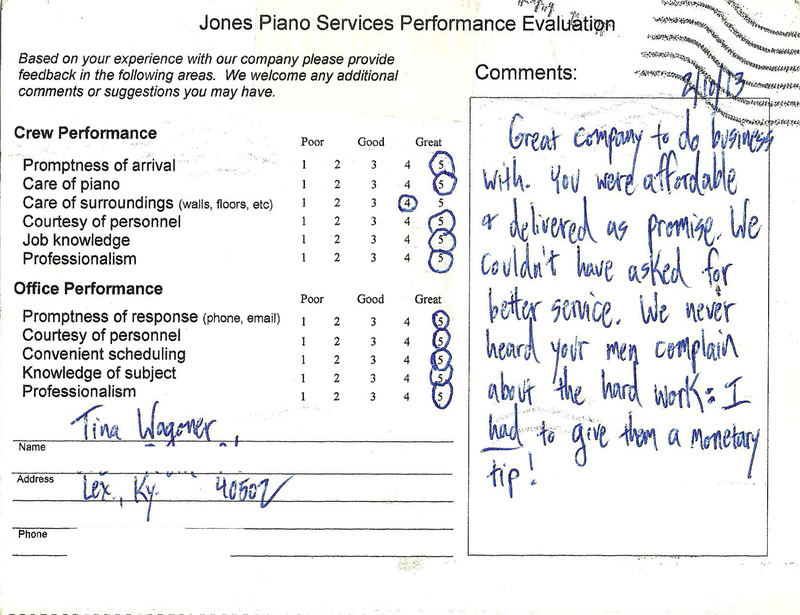 You can trust in Jones Piano Services to transport your valuable instrument safely from pickup to delivery. We ask that you visit our Questions We Ask page before you call us so you'll know what information we need in order to give you an accurate quote. There, you can verify which type of piano you have and see what information we need about the pickup and delivery locations. We cannot guarantee the quoted price if the information we receive is inaccurate or incomplete. Jones Piano Services can move other large instruments as well! We move organs, harpsichords, grandfather clocks, and occasionally large pieces of furniture on a case-by-case basis. We also offer crating services for shipping, as well as the refurbishment of piano cabinetry and other wooden furniture via Danny Jump. Visit our Services page to learn more.